At Davinici Therapeutic Massage, we offer a variety of massage techniques to help fit your individual needs. 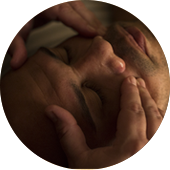 Browse from our palette of specialty massages to individualize your portrait of health. Feel as though your body could benefit from multiple modalities of massage? Experience this woven tapestry of various threads and styles that your therapist will blend and customize for a truly enriched mosaic of relaxation. During this massage, your therapist will utilize a combination of several massage techniques to create a truly unique treatment including Swedish, Deep Tissue, Myofascial and Stretching along with the use of Hot Stones, Hot Towels and aromatherapy are tailored to your needs. 60 minutes...... $80.00 90 minutes...... $110.00 BOOK NOW! Emulate the peacefulness of a Monet painting and smooth the ripples in your pond of serenity with the fluid melodic strokes of this quintessential relaxation massage. Not only does this gentle and soothing massage calm the body and settle the mind but it also restores lost energy. Head/neck (30 minutes) 60 minutes...... $75.00 90 minutes...... $100.00 BOOK NOW! This deep tissue massage rebalances the body that is out of alignment due to occupational, post surgical, and/or emotional stress. The intensive holds and deep pressure stimulate blood flow to restricted areas and relieve knotted muscles. Much like Picasso, this massage will leave a definite “impression” on your muscles. Head/neck (30 minutes) 60 minutes...... $90.00 90 minutes...... $115.00 2 hours...... $160.00 BOOK NOW! Let the rich velvet midnight of a ‘Starry Night” envelope you as the caress of warmed stones create a lullaby of stillness and comfort against the notes of stress in your body. Hot stones are strategically placed and choreographed into motion upon the skin to ease away strain and unease. The heated stones allow for a more intense manipulation and deeper form of relaxation than that of a traditional massage. Head/neck (30 minutes) 60 minutes...... $85.00 90 minutes...... $115.00 BOOK NOW! Recipients are simply calling this technique “heaven”. Although Ashiatsu sessions may appear unconventional, with practitioners often holding on to specially attached ceiling bars to maintain their balance while applying pressure with the foot, on a client’s back, this type of bodywork is being heralded as a luxurious,deep-tissue massage. *Book with Samantha to incorporate Ashiatsu techniques to your massage! This is the recommended massage method for common discomforts associated with the many aches and pains during the many stages of pregnancy. Regular prenatal massages have been proven to ease labor. This gentle but very effective massage is used to treat mental stress, neck and back pain, migraines, TMJ Syndrome, and for chronic pain conditions such as fibromyalgia. 45 minutes...... $65.00 BOOK NOW! This gentle, rhythmic technique that is indicated for boosting the immune system, reducing inflammation and swelling; as well as addressing chronic fatigue and mild depression. (45 minutes)....... $60.00 Body (90 minutes)...... $110.00 Both head/body (2 hours)........ $130.00 BOOK NOW! Available by request. Each individual chooses the massage of their choice. Pricing is determined by the technique chosen by each person. 60 minutes...... $160.00 90 minutes...... $220.00 BOOK NOW! Massage Cupping is form of ancient Chinese technique used to soften tight muscles and tone attachments, loosen adhesions and lift connective tissue, bring hydration and blood flow to body tissues, move deep inflammation to the skin surface for release, and drain excess fluids and toxins by opening lymphatic pathways. Cupping therapy is incredibly versatile and the basic movements can easily be customized to accomplish a wide variety of techniques, from lymphatic drainage to deep tissue release. Add to any massage…… $12.00 BOOK NOW!